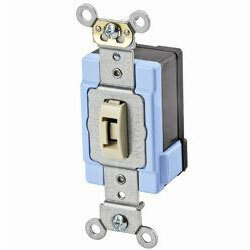 Lev-Lok 20 Amp 120/277 Volt Extra Heavy Duty Specification Grade Tamper-Resistant Key Self Grounding AC Toggle Switches are part of the new line of Leviton devices engineered for fast and easy installation. Leviton's Industrial Grade AC toggle switches for extra heavy-duty applications represent top-of-the-line quality and peak performance. Leviton uses the finest materials available and the highest production standards to produce industrial switches of unmatched versatility and reliability.